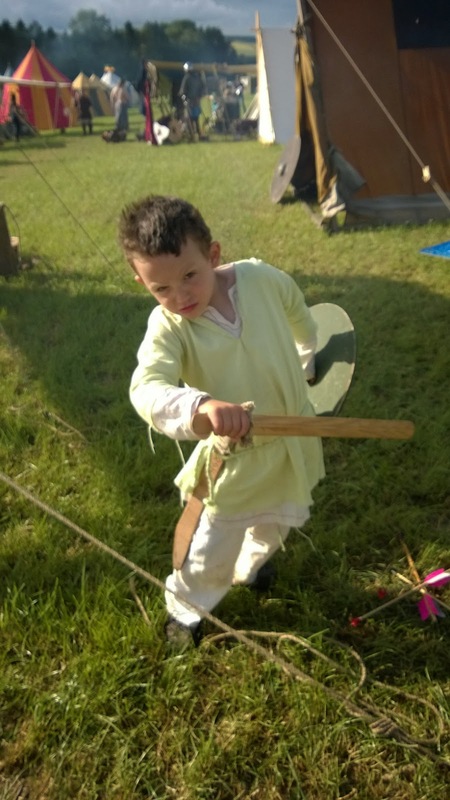 I've been a bit quiet with the posts this week because we spent the weekend being Saxons with our Viking friends at the Chalke Valley history fair near Salisbury (UK) and then catching up on other things when we got home. It was a fantastic weekend of camping, fun with friends and learning about other periods since this was a multi-period event. Each day had battles re-enacted from various periods, air displays and living history demonstrations, plus a variety of food and craft stalls to visit and, for the members of the public, celebrity speakers including Ian Hislop. We're still very green members of the Vikings (just two years), but it has been a great experience. Toby was born into the group and Ollie was just two years old when we joined, so they have known their Viking friends for pretty much their whole lives, which shows in the excitement of seeing their play mates at shows. I don't often get many pictures of the kids in kit, since cameras are banned during public hours for obvious reasons, but here's a couple from after 'wimples off' time at 5pm. One of my favourite memories from this show will be the slight absurdity of drinking coffee from a tin mug served from an American truck by an ex pirate re-enactor while chatting with a group of mediaeval men. We will also be eternally grateful to the lovely friend who let us shelter from the sun and rain under her awning and helped us to keep up with the kids constant demands for food, and all the others who as always provided great company. 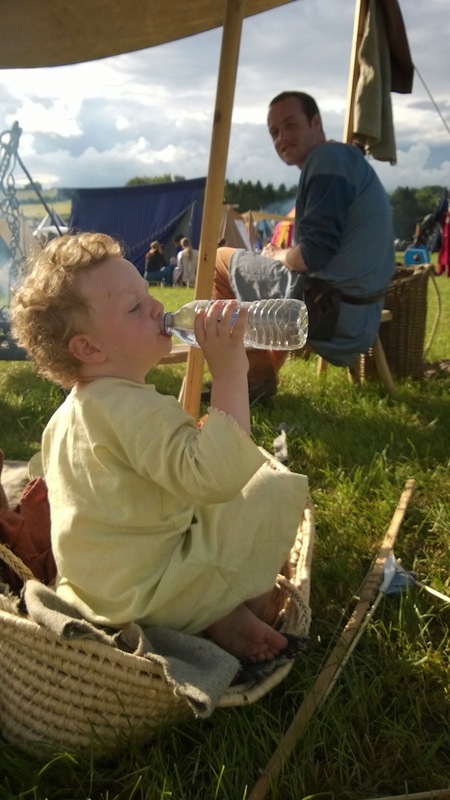 If you have any interest in history and are looking for a fun family activity to make friends, learn new skills and visit amazing places for free, why not look into joining one of the many re-enactment groups around. We don't get paid for shows (apart from occasionally a petrol contribution if it's a major event) but we do get to camp for free and visit events that would normally cost an arm and a leg to get in to. For example, this weekend would have cost us £60 in day passes alone, without adding in camping fees. The opportunities for learning are immense - both in terms of historical information gained and the confidence and general social skills that come with talking to a wide variety of people, including other re-enactors and members of the public. It's no surprise that many re-enactment children grow up excelling at History in school and go on to study it at University. However I've also found they show a self confidence in speaking in front of others which is unusual in our modern culture of tech obsessed text-speaking kids. Even if they're plugged in at home just as much as the next kid, for several weekends a year they are unplugged and charging around in the open air. It takes a village to raise a child. No one said that your village has to be from this century.